From the earliest stages of a company, it’s important to understand the competition. If you don’t know what’s already in the market, you might build a me-too product with similar features and a copy-cat brand. On the other hand, insight into the existing solutions and their positioning will provide you with a foundation for differentiation and powerful storytelling. Whether there are 6 other people building the thing you want to build, or zero, your offering will be influenced by what’s in the market. But managing all that information can be tough. To help founders conduct this process, I’ve developed an approach for tracking and assessing the competitive landscape. I’m a startup brand strategist, so this guide admittedly takes a brand-centric perspective, but the methods apply whether you’re a founder, marketer, PM, or just someone hoping to figure out a category. My approach is premised on the idea that competitive differentiation goes beyond features and pricing. If you hope to build a defensible brand that customers and employees love, you must also understand how your competition positions itself so you can so stand for something unique. That’s what differentiation is all about. In this guide, we’ll start with what the competition is saying, unpack how they say it, then try to deduce why they’re doing it that way. In the end, you’ll have a comprehensive picture of the competitive landscape that goes beyond simple facts, but that captures the shape of the market as well. Collection — record and track competitive details. What is the competition saying? Assessment—assess the nuance of the competitive offering. How are they saying it? Inference—speculate about the competitive strategy based on what and how they’re talking about themselves. Why are they saying it? This step involves the tactical effort of gathering competitive intelligence. It will serve as the baseline for further analysis, as well as a helpful point of reference for your team. For this step, a simple spreadsheet with the right columns would work just fine, but I think Airtable is more powerful for this database-style info management. I suggest using this template. It provides a thorough framework for tracking the key elements of competitive offerings. This competitive tracking template is super. This Base (that’s Airtable speak for “spreadsheet”) comes configured with the main properties of tracking your competition, like price, URL, product images, messaging, and more. Of course, you can add columns as needed. 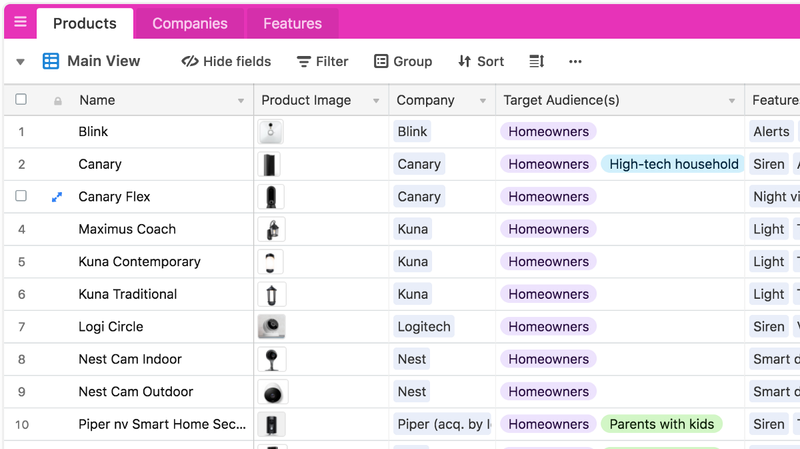 Airtable makes it really easy to sort and group your data, giving each of your internal audiences the ability to view the data relevant to them; imagine showing different details to Sales and Product, for example. Additionally, because Airtable is super flexible, you can extend your tracking with integrations, like automatically updating your spreadsheet when a competitor changes their website (try it). I’ve also created my own forked version of the template that incorporates the material below. It will help you organize the additional layers of analysis beyond just gathering data. You can grab it here. With your competitor database going strong, you should have a sense for What your competition is trying to say. Now let’s look at How they’re saying it. This step moves from factual and observed to subjective and interpretive. This is where you transition from listing features to evaluating brands. Why does that matter? Your competition is more than simply a sum of their features. Depending on your category, there’s a good chance everyone’s offerings are similar, so it’s important to differentiate not only on features but also on brand. 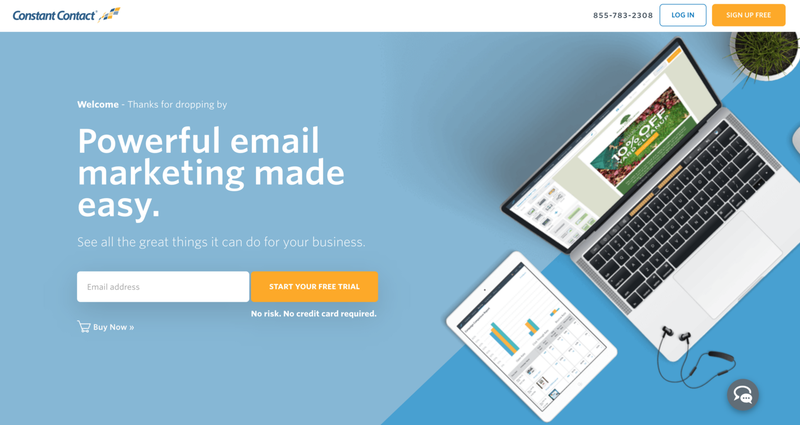 Let’s take Mailchimp and Constant Contact as examples. Both are strong companies with impressive track records in the email marketing space. Both have historically targeted a similar audience—small businesses. Yet the two companies brands’ couldn’t be more different, as we’ll see. As you begin assessing your competitors’ choices, there are four key questions to ask. What is the brand’s personality and voice? One of the strongest ways brands differentiate themselves is through the personality that grows out of their language and design. As a result, you should conduct a thorough assessment of your competition along these lines. To get started, dig into every facet of the competitions’ communications. That includes websites, but also in-app experiences, emails, social media assets, and advertising. Note their headline and subhead copy, email subject lines, color palettes, iconography, and anything else you can get your hands on. Are they playful or serious? Approachable or exclusive? Proud or humble? Try to characterize what they are but also what they are not. Make notes about the impression these elements create. Constant Contact comes across as simple and practical. Screenshots in the hero take us immediately into product functionality, demonstrating it’s usability across devices. The copy on the left is direct. There’s even a “Buy Now” link. Overall, this brand is direct and to the point. 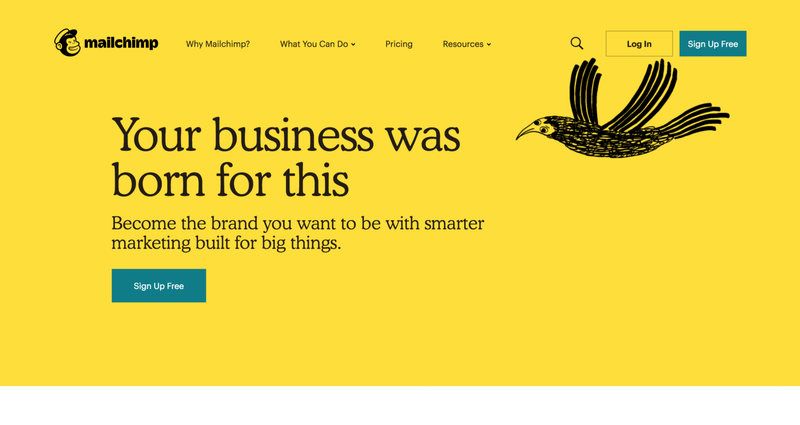 Mailchimp takes a markedly aspirational tone with its headline language. The playful hand-drawn animations and the bright color stand apart from the corporate blues chosen by the competitors, and there are no product screenshots on the home page. This brand is playful, creative, and dreams big. By the way, in the template, I’ve added a “Personality Traits” list that will auto-fill the personality column, helping you search for and find the right words (source). Of course, you can add your own as well. The list of Personality Traits will help explore the competitive brands. Next, you want to understand the type of buyer your competition targets. Even among direct competitors, it’s usually possible to carve-out a specific buyer persona. The differences can be demographic (title, age, ARR, location, etc.) or psychographic (more psychological in nature, usually about hopes and needs). We’re committed to helping small businesses and nonprofits succeed — and to being your trusted partner every step of the way. That’s a subtle and interesting distinction from “small” businesses, and it dovetails with the aspirational tone set by the homepage headlines. Your business isn't’ small—it’s growing. Constant Contact has chosen a largely demographic and objective description of their audience—small businesses and nonprofits. 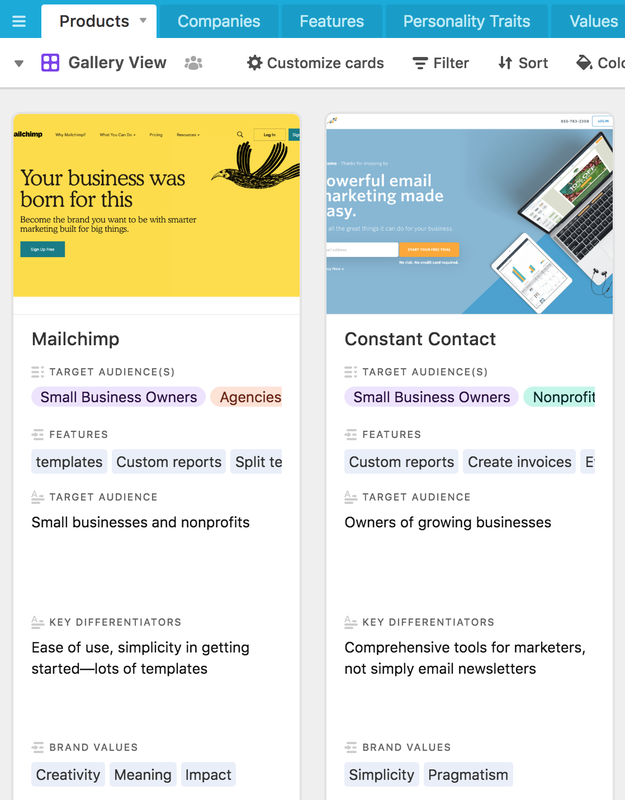 Mailchimp, on the other hand, has chosen a more psychographic approach that gets at the self-perception of their audience—owners of growing businesses. What differentiators do they highlight? You captured the competition’s features and price points during the Collection step. Beyond those two data points, what aspects of their offering does your competition highlight? In any sufficiently mature category, every player will offer similar features. So how do your competitors try to stand out? To start, look for what they highlight on their home page, either in the hero section at the top or just below. Do they focus on simplicity, speed, price? Do they tout reliability and uptime? Maybe partner integrations? 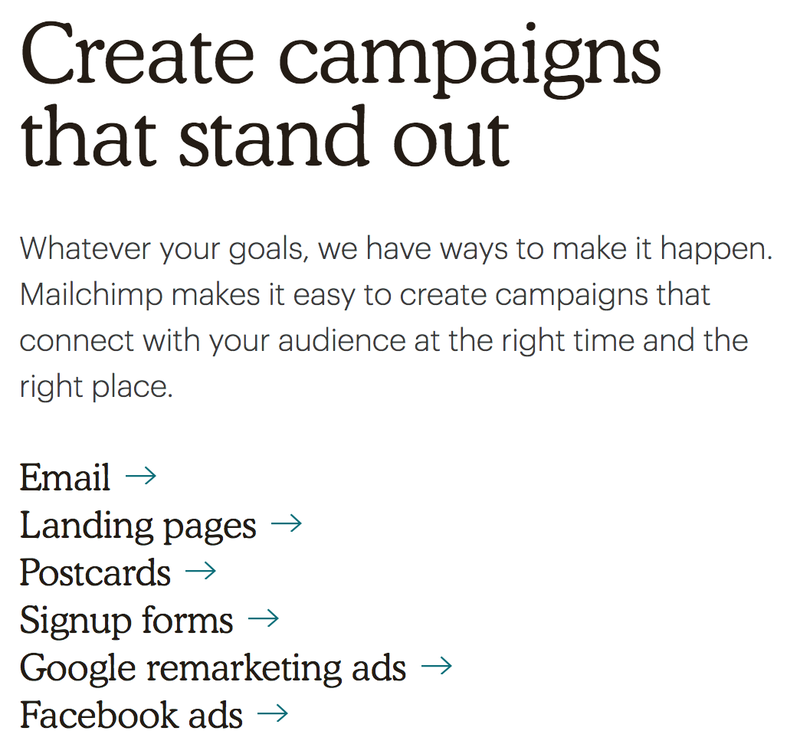 Mailchimp leads their about page with language like “Create campaigns that stand out,” then lists several non-email channels, like landing pages, online ads, and even postcards. That’s an interesting differentiator for what we thought was an email marketing company, and it echoes the “smarter marketing” line in the homepage headline. 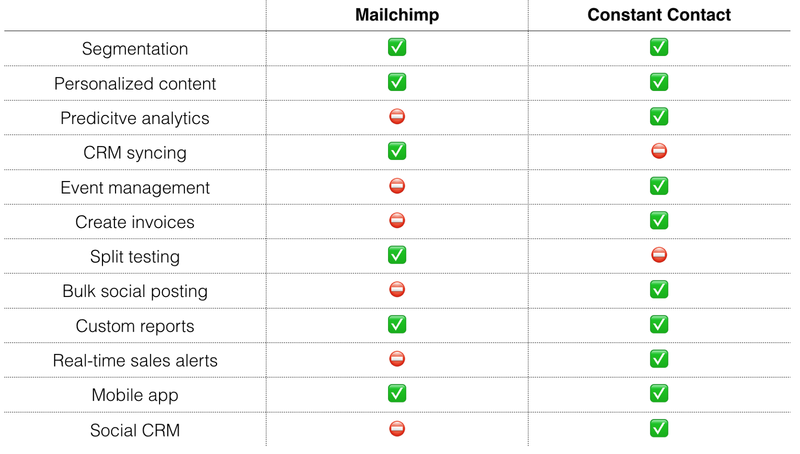 As a result, you could say that Mailchimp is trying to differentiate on the comprehensive nature of their offering. They may start with email marketing, but that’s just the beginning. Constant Contact, on the other hands, seems really interested in templates. In fact, the word “template” appears 10 times on the homepage and another six on the how it works page. Given the practical nature of their personality, it’s not surprising that they would differentiate on ease of use and simplicity of getting started. What does this brand believe? Finally, beyond features and benefits, art and copy, the final step of the Assessment phase is to understand what your competition believes about the world. What values are they trying to surface through their brand? Admittedly, this one can be tough to nail down. But much of what makes a brand resonate is the expression of deeply held beliefs that resonate with a certain audience. For that reason, this step is crucial to assessing the brands you’re up against. As a first step, check out the About Us page. Often, they’ll list values right there. Of course, you’ll want to do your own analysis of how they bring those values to life. Authenticity comes when a brand lives out their promises. If “hand-crafted” is a core value, but the marketing language is all about low prices, or if the brand touts “sustainability” but publicly supports a big oil PAC, you’ll feel some cognitive dissonance. Mailchimp talks about helping to make their community Better, Weirder, and More Human. Reviewing their website, you get a sense of the aspirational and quirky nature of their brand through bright colors and animation. But they’ve gone a step further by supporting and investing in the local arts community as well as funding education and fighting poverty. Those beliefs are stated explicitly, but also brought to life in the site’s experience as well as in the real world. Now that you’ve completed the Assessment phase, you can see the benefit of moving past the simple collection of competitive intel. But that wouldn’t tell the whole story. During the Assessment, we’ve captured how the myriad small choices about vocabulary and design combine to paint very different pictures of two seemingly similar companies. Now you understand what the competition is saying and how they are saying it. The final level of analysis is to try to determine why your competition has made those choices. Of course, any inference you draw should be treated as a hypothesis, since you’ll be making a lot of assumptions. Understanding the rationale behind competitive choices is useful because it can provide you with opportunities for differentiation. Is everyone competing on price? Are all the incumbents stodgy and old-school? What if your top three competitors all take a very serious tone with their brand language? That could mean that they’re all mimicking each other and there’s room for a playful alternative. Or what if everyone seems to be talking to a broad audience? Could you identify a niche persona? Compared to other players, Mailchimp distinguishes itself on brand experience with an aspirational tone, as evinced by their homepage sub-head: “Become the brand you want to be with smarter marketing built for big things.” In a world of providers focused on speed, efficiency, and cost, Mailchimp seeks to appeal to savvy businesses who appreciate design and experience, versus a less sophisticated first-time email marker. Think third-wave coffee shop owner versus a commercial painter. The tone of the art & copy is reinforced by corporate values, all of which are supported by their real-world philanthropic efforts. Any new entrant in the space will have to contend with commodified low-cost leaders on one of the spectrum, and Mailchimp’s rallying of creative and aspirational business owners on the other. Now try summarizing each of your competitors in this way. Writing a synopsis like this will help you in two important ways. First, it will help you integrate all your observations because you’ll have to edit all the data into a cohesive description. What’s most salient, and what are the table stakes? Second, it will help crystalize the differences between yourself and the competition. You’re certain to see yourself more clearly after deeply consideration all the players in your market. In the base, I’ve added an “Overall Impression” column in the template for keeping track of this. The best analysis will be useless if it isn’t shared with your team. Marketing, Sales, and Product should have access to-up-to-date intel to inform their decision making. Thankfully, the Airtable template above makes it easy to share the basics, and the Gallery View is a super simple way to visualize your findings and observations. You can also try the Blocks feature to get more creative with visualizations. You could also maintain something like a Google Presentation that captures the results of your the Assessment and Inference stages. The dimensions of a slide can provide a helpful constraint, urging you to distill only the most important information for various audiences. In other words, your sales team may not want to dig through an Airtable base, but a 10-page deck might help you get your point across. Finally, tracked over time, your competitors’ decision could provide valuable intel on the shape of a category. When possible, it’s great to version control your analysis, as the changes over time will tell you lots about how the market, competitors, and audience evolve. If you’ve followed these steps, your team will have, rich, actionable, and up-to-date information about the competition. You can confidently make decisions about your offering and brand with full awareness of what’s already out there, and how you’re unique. In addition to informing product decisions, your analysis should be instrumental in developing your startup’s positioning statement. You could also fully build-out your Brand Strategy Canvas. Enjoy this kind of thing? Give me a follow on Twitter. Still need help? Checkout my startup branding services. Thanks to Josh Dzielak and Kirby Wallace. Practical brand strategy guides and advice for startup founders.